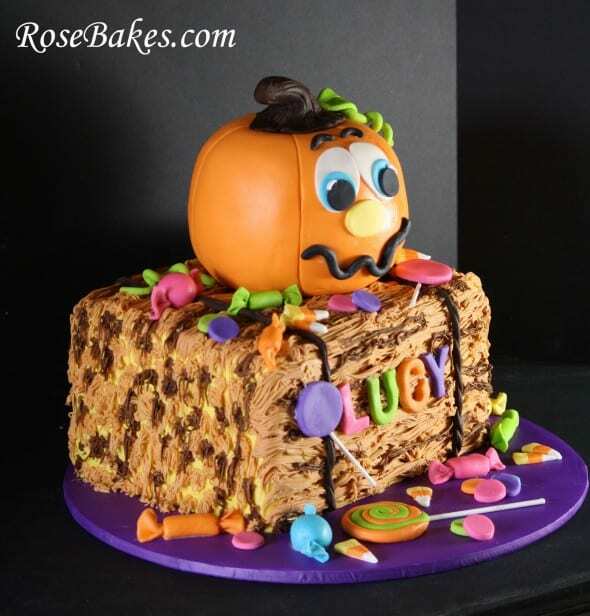 Pumpkin Patch Birthday: Pumpkin Cake on a Hay Bale with Lots of Candy! 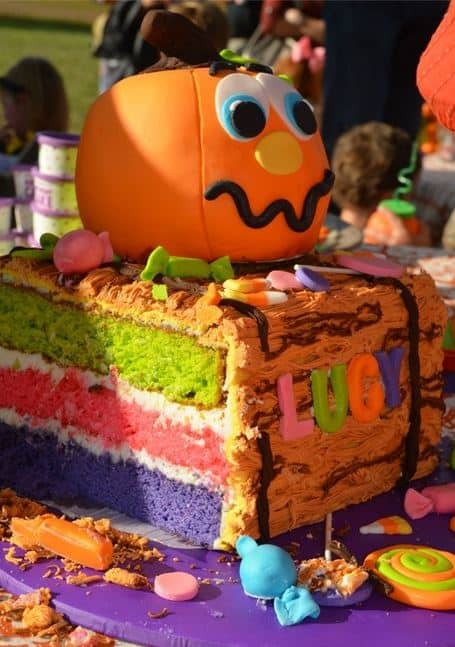 This has to be some sort of record or something… I’m posting a cake on the same day I delivered it… but I just had to share this fun Pumpkin Cake for a little girl celebrating her birthday at a pumpkin patch! Isn’t that a great idea? Her mom told me that Lucy and her friends would be visiting a pumpkin patch, going on a hay ride, painting pumpkins and getting LOTS of candy! I threw all of those ideas together and came up with this fun cake! This hay bale cake is three (3) 2″ layers of vanilla cake. I made each layer a different color… one pink, one lime green and one purple! The size of the cakes is 8″x10″ and I got that odd size by using the alphabet cake pan. For Lucy’s name, I used the White Alphabet Letter cutters! For the pumpkin, that’s the Wilton Sports ball pan. The vanilla cake and the buttercream filling were both orange, to match the marshmallow fondant I used to decorate it. OH, and I used the fun orange pumpkin marshmallows that you can find in the stores right now… saved me a little time on kneading in color (I still had to add some gel color… the orange wasn’t quite as bright as I wanted). For the hay… I first covered the cake in yellow marshmallow fondant. Then I employed a new “technique”… I used my pasta maker attachment (spaghetti shape) for my Kitchenaid! It was fast work versus using my extruder! I started with 3 shades of yellow/tan/brown putting in separate balls hoping for color variation… but the mixer did it’s job and mixed it all up into one shade. Sooo, after I used sugar glue to add all the fondant “hay”… I piped on buttercream in some other shades to add color variation and more dimension in the hay! I used the grass tip to do that and to do all the “hay” on the ends of the bales! 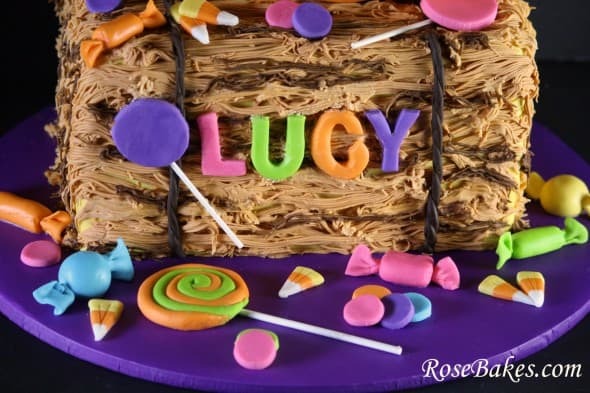 I handmade all the candy from fondant and put it on the hay bale and all over the board. I used a silicone rope mold for the twine. Do you have any questions about this cake? Please feel free to leave a comment and I’ll help if I can! How cool!! I was gonna ask you how in the heck did you create the look of hay….but i read through your post. That’s a great idea using your attachment, I could not imagine using an extruder! that call for carpal tunnel!!! Great job Rose!!! 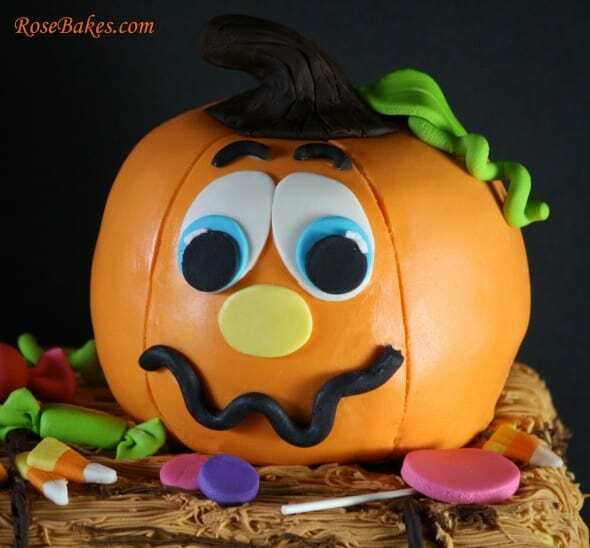 What did you use to make the brown stem of the pumpkin………. (not sure what that is called….LOL!!). LOL!! Yeah, I was really excited to use the pasta attachment – SO much better than an extruder!! I used Satin Ice Dark Chocolate Brown Fondant for the stem! Have you had it? It smells and tastes like brownie batter… YUMM-O!! I would like to know how you keep your kids from eating everything you make. This is such a fun cake!!! You are very talented. Thank you Terry!! I don’t *always* keep them out of it (I could tell you some stories!! ), but for the most part, they get enough leftovers and scraps that they don’t bother my decorated cakes! O to the M to the G……….how PRECIOUS is that cake!!!!!!!!! I agree! You are probably my favorite cake decorator of allllllllll time! 🙂 Its a good thing we’re not neighbors……you would have me arrested for stalking! lol! Again…….kudo’s to you. Great job! Lovely cake! I’d love for you to share this and any other crafts at my linky party, Submarine Sunday. I hope you’ll stop by! Thanks for the invate T’onna! Awww, thank you so much Veronica! That is awesome with the kitchen aid mixer I’ll have to get me one of those pasta makers, I made a hay bale cake last month and it took me ages to get the hay look on it, I did use butter cream so that is probably why. I love yours though! Oooh, not something I’ve done before. 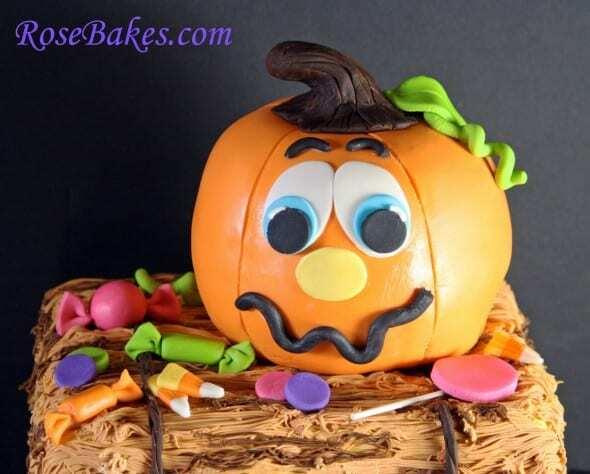 Bakerella used crumbled shredded wheat on her scarecrow cake pops here, so maybe try that? I don’t have any other ideas off the top of my head, but if I think of anything, I’ll comment back! 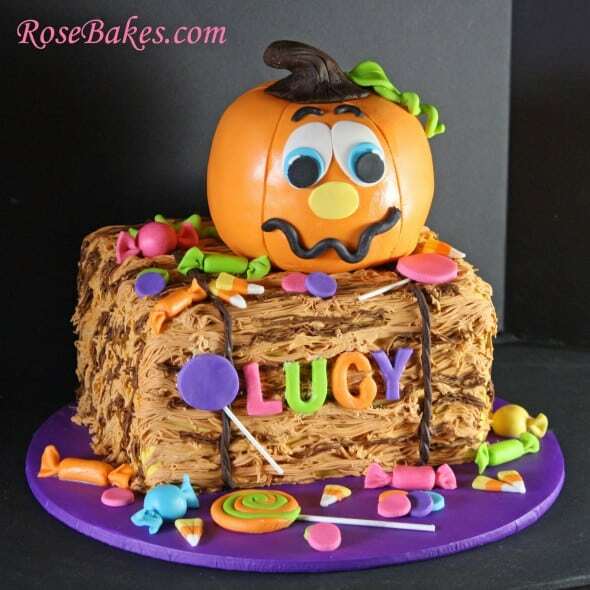 I think you’re on to something….small cake covered with shredded wheat…. I will experiment around…thank you so much! You are so helpful!